As is often the case, Amazon dominated the smart home headlines this week - with news of a new Echo Dot focused at kids, a much cleverer Alexa and the fact that you might soon have an Amazon powered robot living in your house. Elsewhere Spotify went live on Sky Q, we found out that Nest might be a bit of a problem for Google and the people running the Z-Wave platform were gobbled up for hundreds of millions of dollars. Alexa, until recently, "had a coding flaw that could have let malicious developers turn the Echo into a listening device". That's the opener on a great CNET report on how skills could carry on listening, and recording, way after you've finished with them. 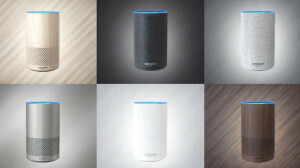 Researchers from security testing firm Checkmarx developed a calculator skill that allowed it to continue listening indefinitely by taking advantage of Alexa's 'Reprompt' feature. For more than a minute after the skill had solved the calculation it carried on listening until a researcher told Alexa to stop. "During that minute, it captured all of the recorded audio in a transcript and sent it to the developers in a neatly packed display window, writing out word for word what the researcher said." Fixed now, but bonkers that could happen, right? Check out the full report over on CNET. The Apple AirPort range - Express, Extreme and Time Capsule - are all on the way out. Apple is only going to sell the ones it has left and will continue to support them for just five more years. It's no great surprise - the lines hasn't seen a refresh since 2013 - and Wi-Fi home mesh systems are much more widely available, and understandable, nowadays. Sonos has confidentially filed paperwork for an IPO, The Wall Street Journal reported this week. It would be valued at $2.5 billion to $3 billion after the IPO (which could happen as soon as June), according to the WSJ report. In other finance news, IFTTT has announced a funding round worth $24 million – including the likes of Salesforce Ventures, Fenox Venture Capital, IBM Ventures and the Chamberlain Group. The automation platform is going to use the money to hire new talent and expand its integrations. Xfinity users can now locate Tile devices anywhere with Xfinity X1 Voice Remote and see results on the television. Comcast is calling it a "first-of-its-kind video and voice control integration." "Simple and easy-to-use, Tile Bluetooth trackers can be attached to any item. If the item is misplaced, lost or stolen, X1 customers can say, 'Xfinity Home where are my keys? ', 'Xfinity Home find my purse', or 'Xfinity Home locate Sam’s backpack' to display the last known location and address of the missing Tile on their TV screen." Comcast and Tile plan to expand eligibility to all Xfinity Internet customers later this year - for now it's just Xfinity Home customers who have the X1 voice remote. GE Appliance’s smart air conditioners, the first Apple HomeKit compatible ones, are now available for sale - boring model names incoming: AEC08LX, AEC10AX, AEC12AX, AHP08LX, and AHP10LX. They are also compatible with Google Assistant, Alexa, and IFTTT as well. Prices start at $229, with Lowe’s and Home Depot your best bet for picking one up.